Condition: Broken bones from car accident. Ligament damage requiring orthotic. "Walter" had suffered from a malunion fracture of his right femur and a luxated left femoral head, from a hit-by-car injury in Stockton. He was taken to the SF/SPCA and then transferred to SFVS, where he had surgery with orthopedic surgeon, Dr. Watt. 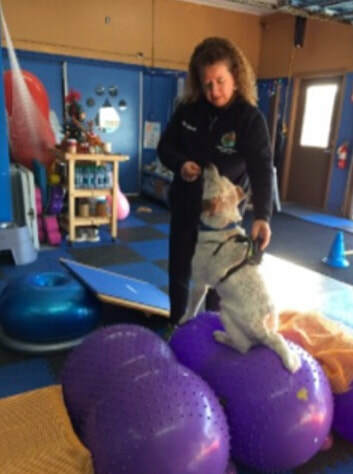 ​He came in to AWAP after surgery for physical rehabilitation, and we set up a team of SPCA volunteers ("Team Walter") to help do his therapeutic exercises on his walks 3 times daily until he was adopted just after Christmas! ​We'd love to send you the latest rehab vet inspiration and insights. Sign up here to receive rehab newsletters from Dr. Ilana and the AWAP staff. (We will never sell or rent your email address.) View our past issues.